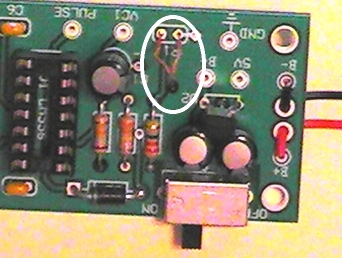 [ ] Install resistors R2, R3, and R4 as shown above on the component side of the CricketSat Circuit Board. R2 is 2.2MOhm (red,red,green,gold); R3 is 330KOhm (orange,orange,yellow,gold); and R4 is 18KOhm (brown,gray,orange,gold). Clip excess leads after soldering. [ ] Install resistors R5 and R6 as shown above. R5 is 33.2KOhm (orange,orange,red,red,brown) and R6 is the other blue resistor in the kit. It's value depends upon the channel number of your transmitter. Clip excess leads after soldering. [ ] Insert resistors R7, and R8 as shown above. R7 is 33Ohm (orange,orange,black,gold) and R8 is 680Ohm (blue,gray,brown,gold). Clip excess leads after soldering. [ ] Insert diodes D2 and D3 as shown above. Polarization is critical. They must be installed with the white stripe at the same end of the component as shown on the circuit card. Clip excess leads after soldering. [ ] Install the three 0.1 micro Farad capacitors C5, C6, and C7 as shown below. They are not polarized and can be installed in any desired orientation. Clip leads after soldering. [ ] Insert and solder the IC timer socket and power switch as shown. Insure that the notch on the socket is oriented the same as on the circuit board diagram. Check to see that all 14 pins go through the circuit board before soldering. Carefully watch out for solder "bridging" between pins of both the IC socket / switch leads. Correct if any are found. [ ] Insert the red LED in D1 as shown. The LED is polarized and must be inserted with the long lead wire in the positive marked hole at it's position. Clip excess leads after soldering. [ ] Insert the three electrolytic capacitors C1, C3, and C4 as shown above. Care must be taken to insure that the longer positive lead goes into the "+" marked hole for proper polarization. The side with the white band is negative. Clip excess leads after soldering. [ ] Insert the 5 volt regulator, U2 with the flat side facing away from the back of the switch. Leave some space between the bottom of the component and the circuit board so the regulator can "stand". Clip excess leads after soldering. [ ] Install the 2-pin speaker jack, as shown below, if you might like to use this port as an access for troubleshooting the transmitter later on. This step is optional and the circuit will work without it. [ ] Install the transmitter module, U3 as shown with the can facing away from the switch. Clip excess leads after soldering. [ ] Install the battery leads and antenna wires as shown through their respective strain relief holes. Insure that the red battery wire in attached to the B+ marked hole and the black battery wire is attached to the B- hole. Clip excess leads after soldering. 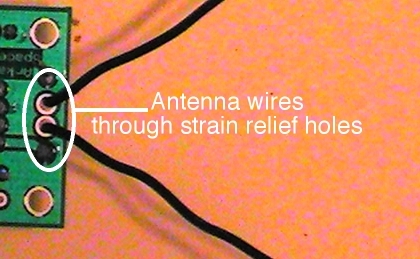 [ ] Install the antenna wires through the strain relief holes, as shown, and pull tight after soldering. Straighten and arrange the two wires at a 90 degree angle from each other for best results. [ ] Insert the 0.01 micro Farad capacitor C2, flush with the board, in the outside pair of holes in the circuit card as shown. The inner pair of holes are not used. Orientation of the leads is not important. Clip excess leads after soldering. [ ] Insert the thermistor, (R1) as shown. The thermistor is not polarized. Clip excess leads after soldering. [ ] Insert the IC556 timer chip with the notch end oriented in the same direction as the notch in the IC socket. Carefully insure that each pin is properly seated in its slot and then press the chip into the socket firmly. You may have to bend them slightly inward to accomplish this step. Test the completed transmitter after all of the following are done. [ ] Insure that all components are properly soldered to the circuit board. [ ] Insure that no solder "bridges" are between any leads, especially on the IC socket, the transmitter module, and the voltage regulator chip. 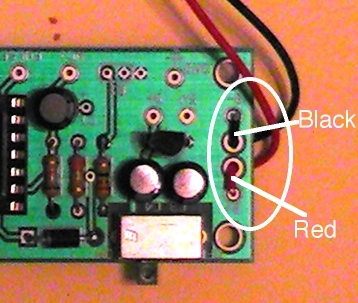 [ ] Insure that the power switch is "off", then install a fresh 9V transistor battery. [ ] Turn the switch "on" and watch for smoke, sparks, or other obvious problems. Should any obvious problems exist; turn the switch "off" and disconnect the battery immediately. If all goes well, a short tone should be transmitted within 20 to 30 seconds. The tone will be heard if a CricketSat receiver or a speaker (optional) is used, otherwise the transmission would be indicated by a brief (half second) flash of the LED when the tone signal is being broadcast. [ ] Calibrate the CricketSat by recording the time interval between "chirps" at a variety of ordinary temperatures. Remember, you can expect the temperature to decrease as altitude is increased, so it is much more important to calibrate at lower, rather than higher temperatures. At least one calibration point should be made in the vicinity of a lamp or other heat source to achieve a 35-40 degree Celsius temperature for comparison. Graph the values gathered for the calibration curve to insure that a blunder has not been made. Recognition needs to be made to Mr. Ed Roberts and the Arkansas Academy of Space Science for Educators (AASSE) for their text material which makes up the bulk of this document. These instructions are available as a PowerPoint document prepared by these individuals. All such software and documentation is available to attendees of CricketSat Teacher Professional Development Workshops conducted under the auspices of the AASSE. This version of transmitter assembly instructions is only meant for the CricketSat LP Transmitter distributed through the Arkansas Space Grant Consortium and the Arkansas Academy of Space Sciences for Educators. Last Updated: 1 April 2007.